Barbara Reynolds (13 June 1914 – 29 April 2015) was an English scholar of Italian Studies, lexicographer and translator, wife of the philologist and translator Lewis Thorpe. She has written and edited several books concerning Dorothy Sayers and is president of the Dorothy L Sayers Society. 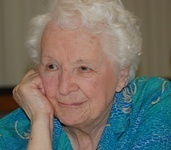 She turned 100 in June 2014.